So folks, here I am. Tor Martin from Norway. 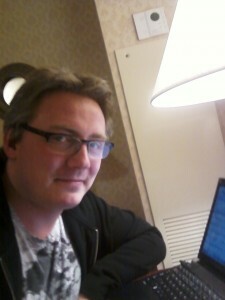 In a San Francisco hotel room trying to make time for some rehearsal. The last week has been kind of awesome spending time with 6 other talented people, Bill Hare and Deke Sharon in Bills studio outside San Francisco. I had planned this studio course way before I suddenly realized – “Hey, There’s an a cappella festival in London. I should be there” and with the Single Singers in the back of my mind (I may not have decided to go if SS didn’t already exist!) I rescheduled my tickets home from SF. Singer and have also composed some stuff), Matt Chinery (UK, See him Sat 16:30 – 16:55 in the foyer with “The Refrains”), Amelia Alder (Australia. Professional musician and director of VocalAustralia. She is with us in her mid and soul, but time and wallet didn’t agree), Chris Crawford (Calefornia. Director of A Cappella Records. Check them out if you want your recordings distributed digitally. Our songs hit iTunes only hours after mastering), Shannon Phypers (Massachusetts. Singer, Director, Teacher and studiotechie), Patrick Volker (Illinois. Teacher and Director) and Aaron Hawkings (Oklahoma. Experienced and talented choirboy). After spending a couple of days in SF with Amelia I’m now on my own doing tourist stuff (Wine tour tomorrow) and relaxing. Looking forward to seeing you all!